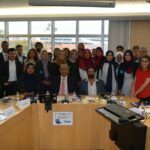 FEMYSO – Forum of European Muslim Youth and Student Organisations » European Street Action Day: Allow me – I am Muslim! 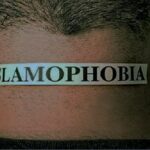 European Street Action Day: Allow me – I am Muslim! About one month ago IGMG (Islamic Community of Milli Görüş) which is a huge faith based NGO working in Europe, Canada and Australia and is located in Kerpen (Germany) organized a Street Action Day in Europe under the title “Gestatten, Muslim|Permettez – Je suis musulman” (Allow me – I am Muslim). To be exact it was a platform of dialog between Muslim and Non-Muslims Europeans to get to know each other better in days where unfortunately media is often talking about but not with Muslims in an untruth way and in a way spreading rumors. 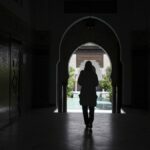 To avoid incorrect information about Islam, young Muslims went to the streets and were available for those having questions on Islam and Muslims in general. At the end of the day the statistics showed how successful this initiative led by the regional and local youth organizations of IGMG has been. In just one day 61.000 conversations were hold in 102 locations in five different European countries. 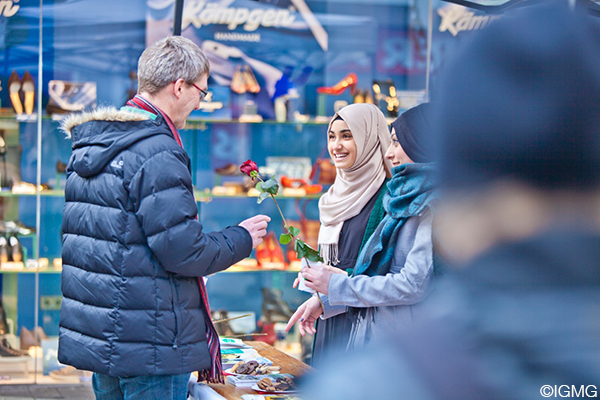 Usually the regional association taking part in this project distributed roses which is the symbol of the prophet Muhammad (peace be upon him), but the regional association of Vienna in Austria endowed 250 kg of apples to visitors. One student studying in Austria had a very nice conversation with an older couple. She complained about the lack of gentleness compared to Germany. In Germany she felt welcome by people surrounding her and was seen as a daughter but in Austria she unfortunately could not feel the same feelings. After the conversation, the elder couple said “Good Bye!” and were gone. After a few time they came back with coffee and cake to see her. Their statement was “now we know you and next time we see you we will welcome you as our daughter. All these stories and more than them happened on this street action day which shows how the society – Non-Muslims and Muslims – need to have a fair dialogue with each other. The invisible barriers between the citizens are bigger than expected and must be solve to reach at the end a society who comes closer to interact with each other and have a common sharing all day life.